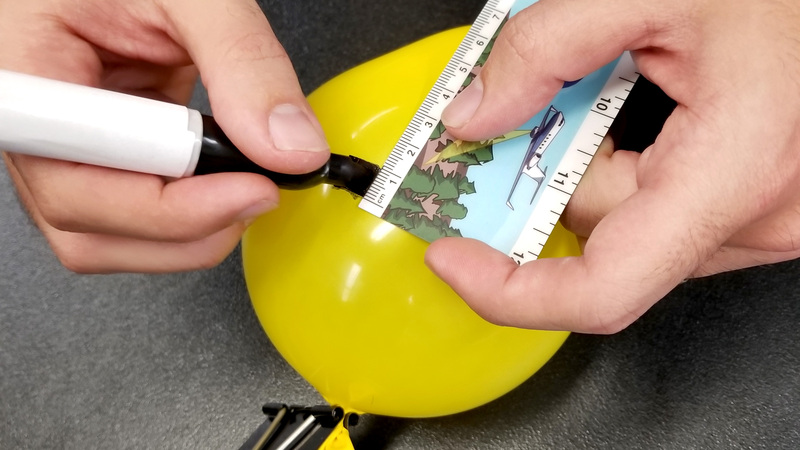 Students may want to work in groups of two in order to be able to handle the unsealed balloon while another student is measuring. 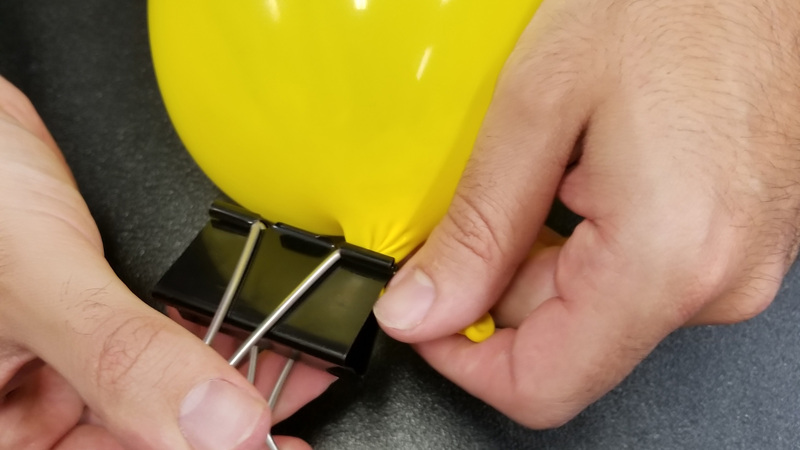 Remind students not to tie off the balloon, as they will need to be able to continue to add and remove air throughout the activity. The square marked on the balloon will stretch at different rates depending on where it is drawn on the balloon. Ask students to share with the class where they drew the square and identify commonalities between square locations. It may help to standardize where the square is drawn after some student trial and error. In order to travel millions of miles to other planets and orbit or rove around once they arrive, spacecraft need a source of power. For some spacecraft, this power comes from the Sun. Expansive solar arrays – wing- or arm-like structures attached to the spacecraft – convert light from the Sun into power. 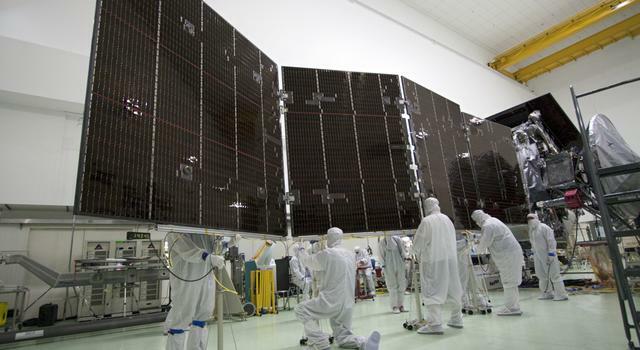 The farther a spacecraft is traveling from the Sun, the larger its solar arrays need to be. That’s because the farther you get from the sun, the less light there is to be collected as solar energy. Most spacecraft traveling to distant planets cannot rely on solar power because the size of the solar arrays needed would make them too heavy or large to even launch. 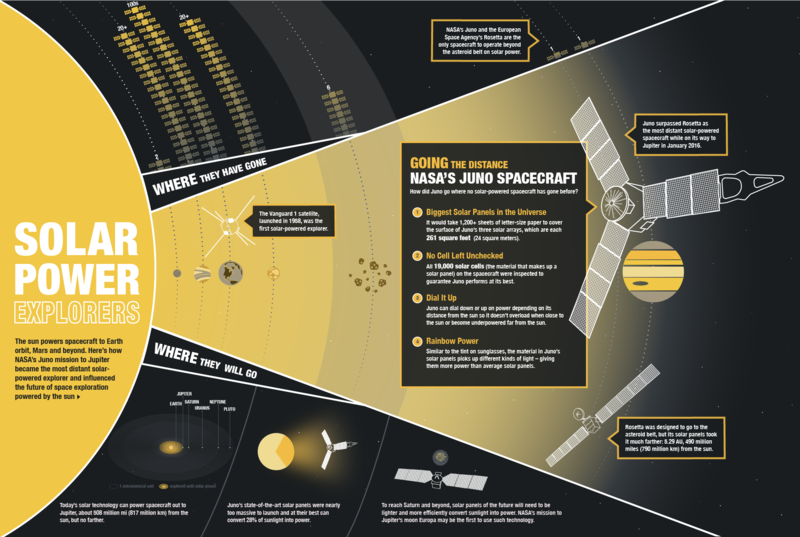 The Juno spacecraft, currently at Jupiter, became the most distant solar-powered spacecraft in 2016 while on its way to the gas giant, which is roughly 500 million miles away from the Sun. So it could gather enough solar power during its journey and while orbiting Jupiter, Juno has three, 30-foot (9-meter) arms covered in solar cells. 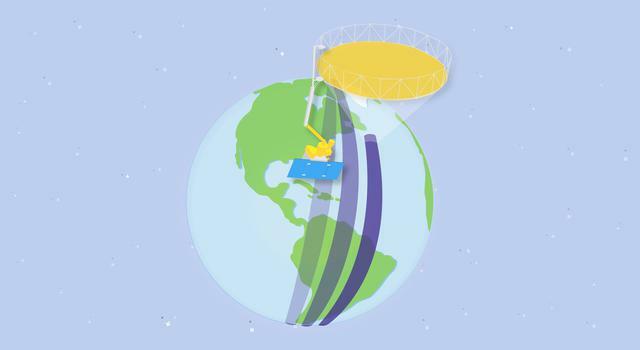 To find out how much solar power is required for these space journeys, scientists and engineers use the inverse square law. Visible light, just like all frequencies of the electromagnetic spectrum, follows the inverse square law, which can be represented as one over the square of the distance from the light source, or 1/r2. Jupiter is 5 times farther away from the Sun than Earth, so using the inverse square law, 1/(5)2, we know that Jupiter has only 1/25 as much available light as Earth. Have students or student teams inflate a round balloon until it has a diameter of about 10 cm. Do not tie off the balloon. (You can use the binder clip to hold it closed.) Tell students to imagine the Sun is always in the center of their balloon. 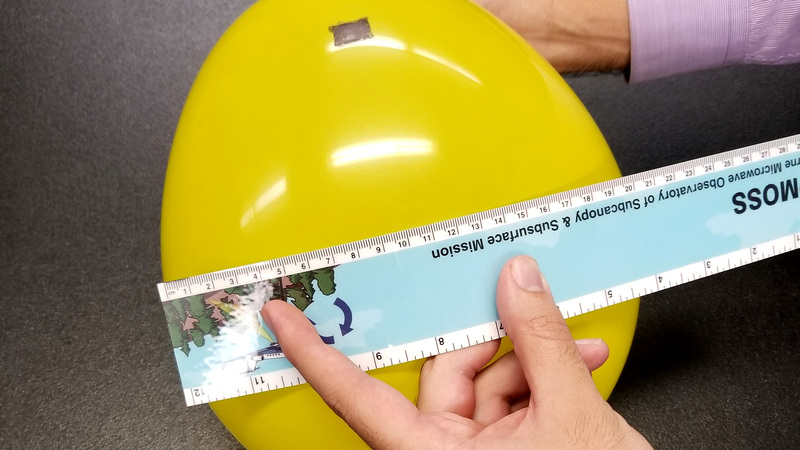 Using a marker, have students draw a 1-by-1 cm square on the balloon. Draw this square near the bottom of the balloon to really see the effect. This square represents light energy spreading out the farther away it is from the Sun (the middle of the balloon). As the balloon gets larger, the distance from the Sun increases. Inflate the balloon until it has a diameter of about 20 cm. The distance to the center of the balloon has now doubled. How has the area of the original square changed in size? Measure and record the size of the square on the balloon now. Inflate the balloon until it has a diameter of around 30 cm. Be careful not to pop it! The distance to the center of the balloon has now tripled. 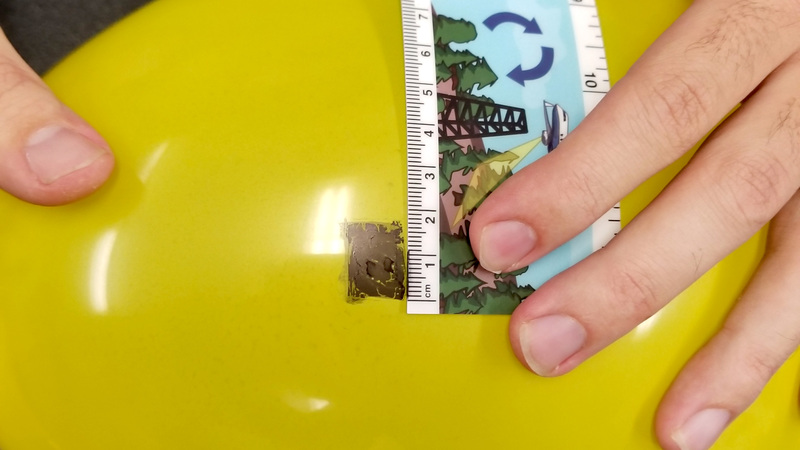 Measure and record the size of the square on the balloon once more. Record your observations and compare the radius of your balloon to the area of the square. Do your findings fit the inverse square law? If not, why? 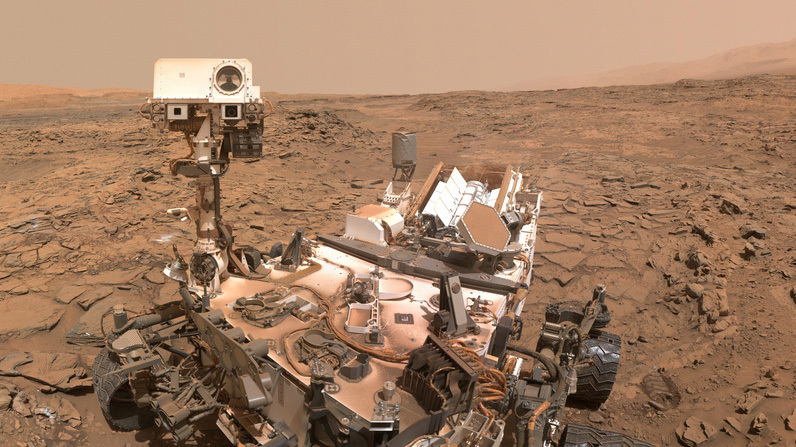 Why is the inverse square law important for scientists and engineers to understand when designing and operating missions far from the Sun? 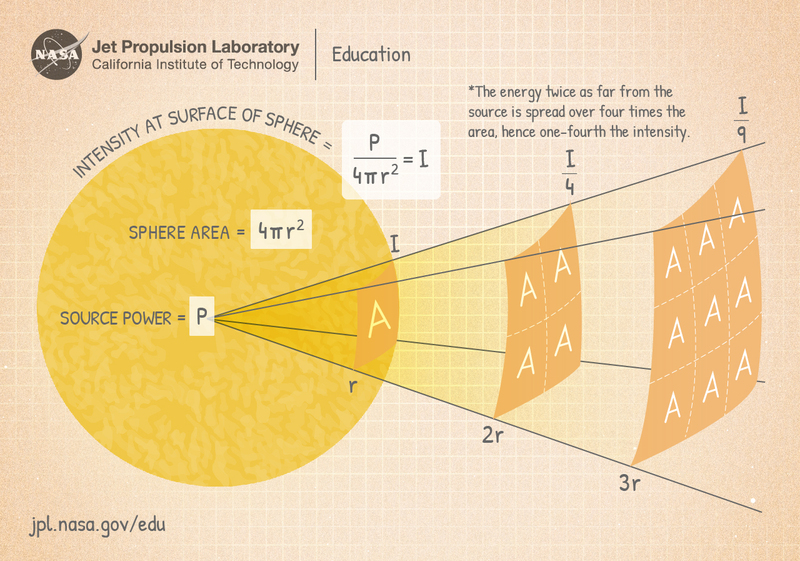 Which other forms of energy might follow the inverse square law? If visible light follows this relationship, what about other forms of electromagnetic radiation?